Entertainment, information, education, and technology are seen as merging into a single medium for educational and research purposes (Heidelberg, 2008). The use of media and technology for instructional and entertainment purposes has received much attention in both academic and popular literature where terms such as edutainment have been introduced and become popular (Ahlers, 2009; Bakke, Steinberg, Faley, & Colton, 2008; Duque, Fung, Mallet, Posel, & Fleiszer, 2008; Jibaja-Weiss & Volk, 2007; Kara & Yeşilyurt, 2007; Steffes & Duverger, 2012; Walldén & Soronen, 2004). The term edutainment has been credited to Robert Heyman in 1973 who coined the term when he produced multi-media educational materials for the National Geographic Society (Wang, Zuo, & Li, 2007). He names the game type of his education movie as Edutainment. Capila and Bhalla(2010) conceptualized edutainment as the process of designing and executing a media message to educate and entertain in order to increase audience knowledge on an educational issue. Meanwhile, Argan and Sever (2010), had acknowledged that edutainment today takes a wider perspective and a broader meaning, not limited only to games playing. So, Edutainment can be defined as the act of learning through a medium that both educates and entertains using various digital media, such as animation, computer games, courseware, and mobile application or even still video . 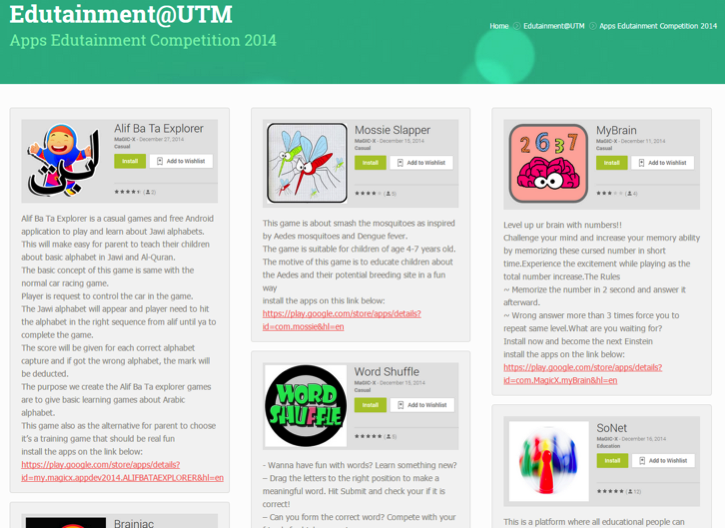 UTM has decided to implement edutainment as one of the project in the New Academia Learning Innovation Model since 2013. This project highlights the combination of education and entertainment elements (edutainment) to make a lesson fun and entertaining. This way, students can improve their reception and the learning process will be more effective. The main purpose of UTM own edutainment model is to encourage students to learn through exploration, interactivity, trial and error , and repetition of the situation so that students feel the excitement without realizing that they are learning at the same time. This model is heavily influenced by social learning theory (Bandura, 1977), in which humans are believed to show the effect of the change based on the information received by them unknowingly. UTM Edutainment apply the Student to student concept that emphasizes on development of learning material either in the form of video , animations , simulations or computer games by the students themselves. This is because students can easily deliver information to other fellow students in their own ways to improve mutual understanding and knowledge. It should provide a conducive learning environment and fun that create a positive feeling. It should be able to motivate the students to continue learning until the end of session. It should insert challenged activity such as case studies, problem solving and etc. The contents should be tailored to the curriculum taught in UTM or school levels in Malaysia generally. The format should be in a digital format such as video, computer simulations, computer games, mobile application and learning software (courseware).